Leading Republican presidential candidate Donald Trump is holding a ‘sold out’ rally in Columbus, Ohio Monday evening. 15,000 supporters are expected to attend the event at the Greater Columbus Convention Center. The Columbus Dispatch reported the last tickets were claimed Friday night, three days before the Monday night rally. 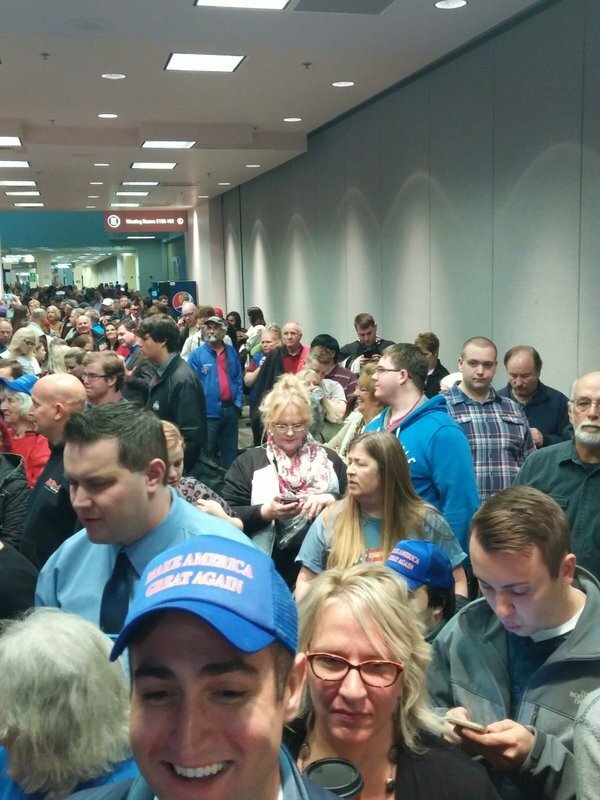 Donald Trump supporters line up nearly three hours before start of Columbus, Ohio rally, image via Twitter. Going to Ohio, home of one of the worst presidential candidates in history–Kasich. Can't debate, loves #ObamaCare–dummy! DONALD TRUMP IS GONNA BE IN COLUMBUS. TICKETS ARE ALSO FREE. EVERYONE RESERVE ONE BEFORE REAL RACISTS GET THEM. More here with several claims of bogus ticket orders with names like Jesus Freedom, and here and here. A Periscope video here taken by Andy Chow of Ohio Public Radio shows thousands of people walking in an orderly manner on their way in to the Trump rally. A photo taken a few minutes before the doors opened at 5 p.m. EST shows the size of the room Trump is expected to fill. These two photos taken just after 6 p.m. EST shows the room filling up. While the libs’ bogus ticket order scam failed, there were reports however of groups of liberals protesting outside including Planned Parenthood and Black Lives Matter protesters.